LOW NATURAL GAS PRICES ARE DRIVING NEW INTEREST IN THE USE OF COMBINED HEAT AND POWER (CHP) TO COMPLEMENT RENEWABLE RESOURCES — ACHIEVING COST SAVINGS, EFFICIENCY IMPROVEMENTS AND ENVIRONMENTAL BENEFITS. Not only are U.S. utilities faced with responding to market pressures and regulatory demands, they have to take into consideration distributed technologies, which are poised to transform the way electricity is produced and delivered. The rise of distributed generation (DG) is a compelling factor in this change. In fact, most survey respondents expect that, by 2020, DG could represent as much as 20 percent of total generation, possibly rising to a 30-percent share by 2030. Solar is leading the way as a green power source, while combined heat and power (CHP) follows close behind. CHP is a widely used solution at university and government campuses, at industrial and corporate facilities, in small-scale power generators, and as emergency backup generation. With the growing number of intermittent generating sources, such as solar and wind, utilities have long valued the operating flexibility of natural gas — most of all, its ability to start, stop, and ramp up and down quickly. Using natural gas to shape the load of renewable resources provides overall cost savings, improvements in system efficiency and environmental benefits. CHP systems are DG technologies that use an energy conversion device — an engine, turbine, or fuel cell — to capture heat during electric generation that otherwise would be exhausted into the atmosphere at a conventional power plant. That captured heat is then used to produce hot water, steam (or cooling) at industrial or commercial sites, or for single or multifamily homes. CHP enables end users to save on energy costs, while increasing total energy efficiency compared to conventional power-only technologies. CHP can meet even the most stringent emissions requirements, and play a critical role in providing the flexibility to accommodate the intermittency of renewable energy sources as the nation’s energy mix evolves. GTI is at the forefront of advancing technologies for improving the overall efficiency of CHP systems and reducing their emissions. In recent years, GTI has partnered with a number of industry and government stakeholders to introduce advanced CHP systems to the marketplace, and to remove barriers to their adoption. Other factors driving the development of CHP technologies are the increased supplies of low-cost natural gas, environmental policies, and the need for improved grid reliability and resiliency. CHP can be deployed at strategic locations to mitigate peak demand constraints and the potential loss of power due to severe weather events. The Environmental Protection Agency (EPA) estimates that the U.S. currently has an installed capacity of 82 gigawatts (GW) of CHP. There are more than 57 GW of natural gas CHP systems — mostly large, gas turbine units. Since 2010, however, there has been an increased use of natural gas engines, microturbines and fuel cell CHP systems. These account for more than 87 percent of new CHP installation sites and 26 percent of new capacity. 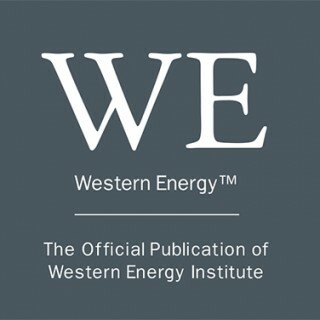 The Center for Sustainable Energy estimates that there are more than 8,500 megawatts (MW) of active CHP in California at more than 1,000 sites — with the potential for increased adoption of CHP systems at existing and new facilities.2 The California Air Resources Board (CARB) identified CHP as the state’s third-most significant potential source for greenhouse gas (GHG) emissions reductions. It set a reduction target of 6.7 million metric tons of carbon dioxide (CO2)by using 4,000 MW of new CHP by 2020. One way the state is helping drive the growth of distributed energy resources such as CHP is the California Public Utility Commission’s Self-Generation Incentive Program (SGIP). It offers rebates to customers who install CHP systems — both conventional systems (internal combustion engine, microturbine, gas turbine and steam turbine) and emerging systems (fuel cell) on the customer side of the meter. CDH Energy, a GTI subsidiary, serves as a certified performance data provider (PDP) for the SGIP initiative. “We vet the data and submit it on behalf of the system owners to the utilities,” said Hugh Henderson, founding principal at CDH. The company is monitoring fuel cell-powered CHP systems throughout California, as well as conventional CHP systems at a hospital, a community college, a greenhouse and a wastewater treatment plant. On the East Coast, CDH Energy is working with the New York State Energy Research and Development Authority (NYSERDA) to develop measurement and verification requirements for a performance-based incentive CHP program in Consolidated Edison’s service area. The company also monitors the performance of CHP and other clean energy technologies for the Alternative Portfolio Standard program in Massachusetts. In California — especially Southern California, which is known for some of the world’s strictest emissions standards — some CHP technologies have been challenged with meeting 2007 CARB emissions criteria. GTI, in partnership with the U.S. Department of Energy (DOE), the California Energy Commission, Southern California Gas, and equipment partners, is working to change that. GTI has developed a cost-effective, gas turbine-based CHP system that can significantly increase energy efficiency while meeting — and even exceeding — stringent CARB regulations for nitrogen oxide (NOx) and carbon monoxide (CO). The flexible CHP system (FlexCHP-65) is already yielding significant benefits. 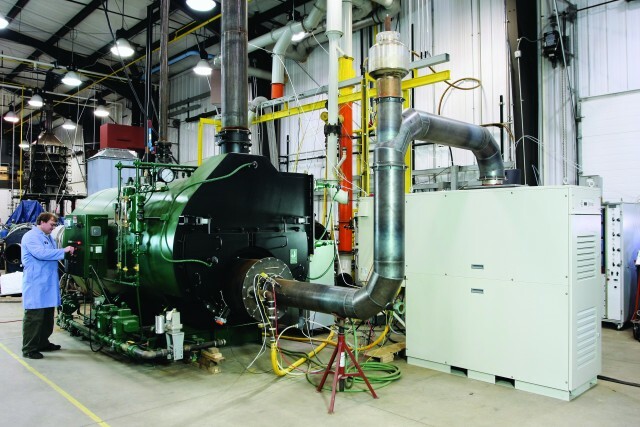 Researchers have developed a cost-effective, supplemental, ultra-low-NOx (ULN) burner that eliminates the need for selective catalytic reduction (SCR) flue-gas treatment. It reduces capital costs by up to 25 percent and eliminates adoption barriers for small- to medium-capacity facilities (15 MW or less). The ULN burner is integrated with a 65-kW microturbine and a heat recovery boiler. It also has a new electronics control panel that merges the equipment with the various sensors and devices required for system operation into a single package. In 2013, the FlexCHP-65 system was installed at Inland Empire Foods, a legume processing operation in Riverside, California. Initial field performance results demonstrated that the system achieves an overall efficiency of 82.4 percent, with significant emissions reductions across the full range of firing rates — achieving NOx levels 50 percent below CARB limits. Inland Empire Foods was able to use a highly efficient boiler and recover all the waste heat from the microturbine, which created additional process steam and provided electricity for other operations at the plant as the company expanded. The system has operated in 2015 without any disruptions in performance. In another effort, GTI worked with Southern California Gas, Continental Controls Corporation, the Energy Commission, and other partners to demonstrate a new sensing and emissions control system for reciprocating engines. The new system meets stringent emissions regulations passed by the South Coast Air Quality Management District. It offers an automated control system that can help companies maintain continuous compliance and simplify operations. It provides excellent control and mixing fuel and air for optimum combustion, and it uses advanced air emissions sensors for engine feedback control. The system was tested and validated at Fontana Wholesale Lumber in Fontana, California. The company produces nearly 100 percent of its electricity onsite and it uses waste heat from a CHP natural gas engine to operate the kilns that are used to treat lumber. There are efforts worldwide to commercialize micro-CHP systems, which provides heat and electricity to households and businesses. Significant progress has been made in Japan with engine-based systems and, more recently, with fuel cell micro-CHP products. In the U.S., high equipment costs have hampered growth, but the technology holds great promise for utilities and consumers. “Energy efficiency advocates have strong interest, and utilities are looking at it as a load-growth opportunity,” said Tim Kingston, senior engineer at GTI. There is a demonstrated market — more than 100,000 units per year — for natural gas power generation in homes, as evidenced by the significant growth in natural gas standby generator sets over the past decade. Many consumers are paying $5,000 or more to have the security of a backup natural gas generation system that provides 5- to 20-kW of emergency power. The big challenge for micro-CHP market adoption continues to be the high first cost. In 2013, GTI published an in-depth study of micro-CHP, which concluded that, for micro-CHP to gain market traction beyond niche markets, the cost for the equipment needed to be reduced to between $2,000/kW and $4,000/kW. Otherwise, electrical efficiencies had to be dramatically increased to justify the high costs. With the potential entry into the market by A.O. Smith Corporation, a global water heating technology company, there is optimism about the future of micro-CHP in the U.S. The company recently entered into an agreement with the U.S. Department of Energy (DOE) to evaluate micro-CHP generation equipment for light commercial applications. GTI also is testing micro-CHP technologies in its laboratories. The most recent technology being tested is M-TriGen PowerAire, a packaged 4- to 6-kW system that combines power, hot water, space heating, and cooling for residential and small-commercial customers. As a showcase field demonstration, GTI is working with EC Power MCHP Corporation to demonstrate a 25 kW internal combustion engine-based, micro-CHP system at Southern California Gas Energy Resource Center. The system uses a post-combustion NOx reduction process to potentially meet CARB emission requirements. The overall efficiency of the micro-CHP system is expected to exceed 92 percent, if the waste heat is made useful. The target, installed cost of the EC Power system is less than $4,000 per kW. While natural gas is the dominant fuel source for CHP systems, there is also growing interest in using biomass and waste as a fuel source that can help reduce the environmental impact of energy production, and help meet renewable portfolio standards (RPS) in many states. GTI is working to develop technologies that enable the integration of renewable resources (such as biogas) into CHP systems. This includes addressing fuel cleanup and application-specific challenges with using biomethane in natural gas distributed generation and CHP technologies. Previously, GTI worked with Gills Onion in California, an onion grower and processor, Southern California Gas and the California Energy Commission to demonstrate an advanced energy recovery system. It converts 100 percent of onion waste by digestion into biogas, which is subsequently put through a gas cleaning and conditioning process to make it suitable for use in an ultra-clean, 500-kW fuel cell power plant. CHP offers immense potential for generating energy efficiently and, with advances in technology, it is more cost-effective, reliable and efficient than ever before. Continued attractive prices for natural gas, along with federal and state incentives, promise to help increase deployment of CHP systems. GTI’s research, development and demonstration programs in California show that CHP systems can help utilities and their customers reduce the environmental impact of power generation. CHP can meet even the most stringent emissions requirements, and play a critical role in providing the flexibility to accommodate the intermittency of renewable energy sources as the nation’s energy mix evolves. With the ability to deploy grid-independent operation for customers, CHP systems also provide great economic value and power reliability to end users. The American Council for an Energy-Efficient Economy suggests three ways in which electric utilities can benefit from CHP: by rate-basing the asset, leveraging CHP as a resource for meeting energy efficiency goals, or as a for-profit business. The EPA’s CHP Partnership lists additional benefits, including reduced peak demand and grid congestion, reduced fuel-price volatility, and deferring or displacing more expensive transmission and distribution infrastructure investments. As CHP activity is heating up, its many positive attributes can pave the way for market adoption, transforming the way electricity is produced and delivered. Julia Bailey is a freelance writer based in Chicago who specializes in energy and environmental issues. William Liss is a 29-year industry veteran and the managing director of energy delivery and utilization at Gas Technology Institute (GTI). GTI is a leading research, development and training organization that has been addressing global energy and environmental challenges by developing technology-based solutions for consumers, industry, and government for nearly 75 years. FlexCHP microturbine and heat recovery boiler being tested in a laboratory at GTI.